Looking back on 2007, it has been a productive year. I've brewed a total of 74 gallons. That's about a 54% increase over 2006. Not totally sure what to expect for 2008. I know I'll have some interesting work to do in relation to Half Acre Beer Co. And I'll be brewing at least a couple beers for my brother's wedding in October. On top of that, I really want to experiment with some very funky intentions. Not knowing if I'd ever keep up with it, I started this blog in January. It's been a lot of fun compiling information, designing the layout of posts and the look of the blog, learning about HTML coding, taking & importing photos, and more. I'll admit my writing style is...well...a bit dry, so that is something I'll try to let loose on. One thing I like about it is that each beer entry contains evolving/updating content and photos. I also try to include as much information about each beer as possible. So when you read a new post, be sure to revisit them for updates on progress, and final tasting notes. I've met many online brewers, and reading their blogs has been fun and informative. I've subscribed to just about all of them. There sure is a lot of great information among the double handful of us writing about what we're doing with recipes, equipment, processes, and more. I feel good about being a part of this virtual community and it's fuller experience. I don't enter my beer in many competitions, but this year my Hop Blend IPA won 2nd place at the Schooner Homebrew Championships in Racine, WI. Up against the most entrants for a beer style, and a fairly cut-throat category, I'm honored to say the least. 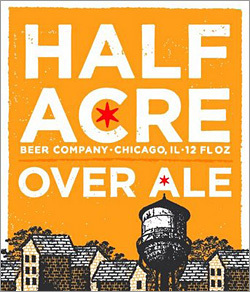 Teaming up with Half Acre Beer Company has to be the biggest thrill this year. What a great team of people they are, and totally motivated to putting out the best beer possible. I get to brew small batches as a way to explore new beer offerings. I really look forward to what 2008 has in store for the continuation of my relationship and involvement with the growth of this fun beer company. I can honestly say that I love brewing beer more than I do drinking it. Maybe it is because of my age? Maybe because I've had my fair share of it over the years? Maybe because of all the technical attributes in the whole process? Maybe because I do things for the skill and perfection of it? This past year has brought many understandings...how ingredients work together, how to decrease off-flavors at many stages in the process, how to increase mash efficiency, how to lay off on bittering hops for maltier styles, how to brew better test batches, and how patience really pays when aging beers that need it. By following solid recommendations for each beer style, and having a simple and dialed-in kitchen brew house, my beer usually comes out at a level that is close to commercial in quality. That is what makes this hobby even more rewarding. I look forward to what 2008 has to offer. It should be another big one. One major area of change, is figuring out how sustainable this hobby can get. I also want to learn how to take quality photos of the finished beer. Sarah already has great cameras and lenses. Now I just have to tap into her knowledge and experience. Well, thanks for visiting and returning to my site. I appreciate and value all of your comments and dialog. Lastly, I'll just wish a BIG Happy New Year to everyone! Cheers! Thanks for sharing your thoughts and experience. I look forward to reading your blog 2008. I've learned a thing or two here. I'm interested to hear about your herbal beers soon. I too enjoy the kindred spirit of other blogging homebrewers. Agreed-always one of the first blogs I read when I make the online rounds..always good stuff and very informative. Cheers to you and your readers also happy new year! Thank you guys. I also look forward to reading about the brews you got going. Its been a fun year. Here's to a great...two thousand eight! You have a great blog and I wouldn't say that your writing was "dry" to anyone that knows what they are talking about. You have a very complete way of outlining both your intentions and your results. I look to your blog for how thoroughly you explore your brewing. I really enjoy your blog and finding it actually gave me inspiration and confidence to continue writing on mine. It's great to find an online community where you can let the thoughts flow and then get some great feedback. I have to agree with you that I almost enjoy the process as much as drinking the beers. For me, I love thinking of the idea, designing the label and the recipe, and now because of the blog, posting about it. My goal for 08 is to get to where it sounds like you are with tweaking the small parts to make the end product better. I think that's another way the blogs help is to share ideas and techniques. Thanks for sharing your thoughts and posting the great detailed posts. I'll keep checking in. I'm glad to know you all, and to find value in all of your writings. It makes me very happy to know that the content written here is meaningful and useful to you. Maybe I'll just keep writing the way that I do. Its natural, so its good. I've always been fairly thorough, and maybe that's evidence of a business school mind warp. I have this thought that the more I document now, the easier it will be, for me to resume brewing, if I ever have a long hiatus. Then when I'm older and greyer, I can review all these notes, dust off the equipment, and brew like I never stopped at all.